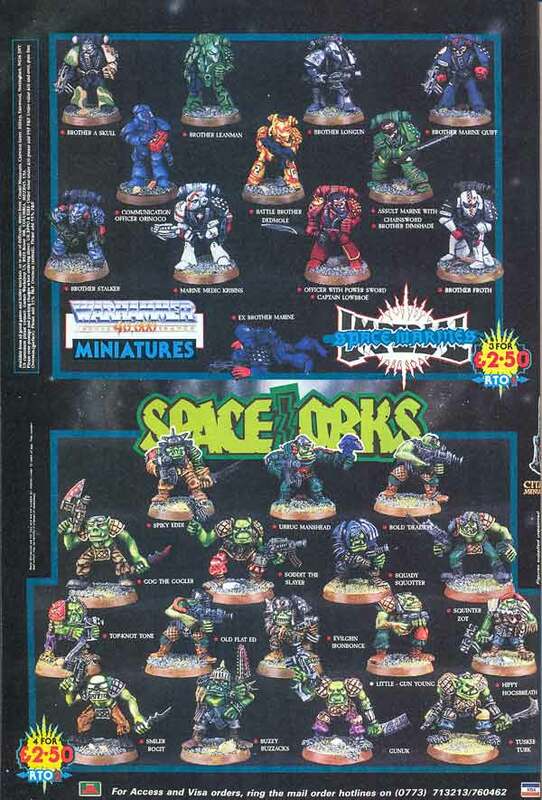 Hello again, today's post is featuring a few Oldhammer 40K miniatures from my slow burner project the 'Flesh Tearers', one of the original Adeptus Astartes chapters from the Warhammer 40000 Rogue Trader rulebook page 168. The Flesh Tearers chapter started off all adorned in black in 1987 rulebook then later around 3rd edition (I think) the Flesh Tearers became successors to the Blood Angels crimson bodied with black shoulder pads and helmets which is a colour scheme that appeals to me so I decided to go with that, a mistake on my part was painting the helmets crimson but in the end I liked how these turned out but I will be going back to black. I am still working on my technique for flesh tearer icons so I may revisit them when I get it down to an art, they are a bit rough at the moment and a mix of the original style which had 8 spokes and the modern style which had 16 spokes, I think I am getting to the stage where I may have to order some decal paper and create my own 😭. 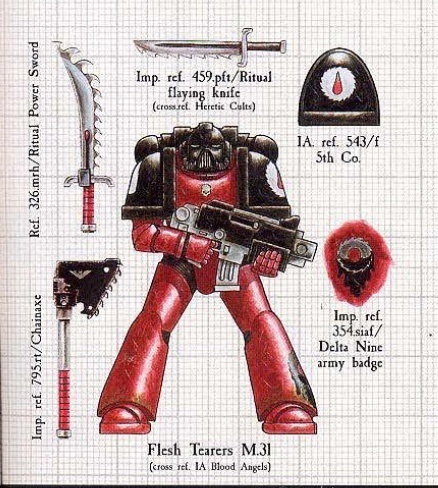 I did find a great chapter symbol painting tutorial here. First up we have RT01 Space Marine 'Captain Dozier' who first appeared in the White Dwarf 99 advert , armed with a Chainsword, a bionic arm which mounts a surprised discovery a buzzsaw blade which I felt was very fitting of a Flesh Tearers marine and a bionic eye, like a lot of marines from this era this marine is a veteran and really been through the meat grinder. Sculpting is credited to Michael and Alan Perry and was released in 1988. 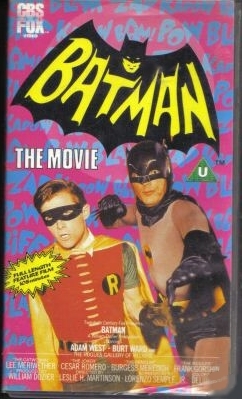 The name Dozier is a pop culture reference to Batman TV show producer William Dozier, this range took many names from the Batman TV show which was still popular on the UK's morning children's TV and the Batman 1966 movie had just been remastered and released on VHS video. Following on we have RT01 Space Marine 'Brother Ward' again from the White Dwarf 99 Advert , armed with a Power Sword and equipped with a sensor that looks very much like the plastic 'ammo pack' on the RTB01 plastic Space Marine sprues, again the sculpting is credited to Michael and Alan Perry. The name Ward is a pop culture reference to Robin in the Batman TV show actor Burt Ward. I experimented with a Pebeo iridescent blue green Dyna 357 acrylic paint for his power sword which I purchased from Cassart, it achieves a nice effect for little work, get yourself down to a Cassart shop there are lots of art supplies that translate to our hobby and their cheap ProArte Masterstroke series 60 brushes are excellent. Next we have RT01 - Communication Officer Orinoco (also named Kendall on some W40K flyers) from the 1987 White Dwarf 93 advert, he is well equipped with all sorts of gadgets including his strange looking comms helmet. Much is the love for this miniature that Forgeworld have made a modern version of him called the Master of Signal, this one is a Bob Naismith sculpt. 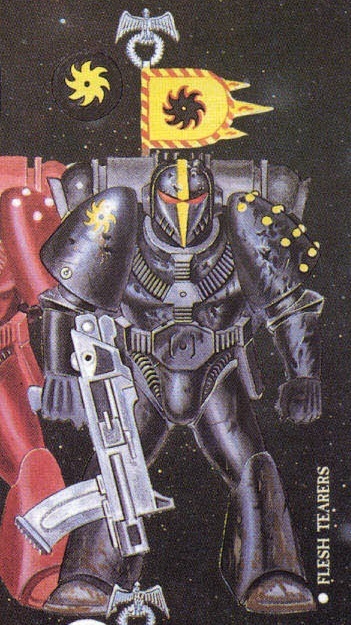 I mounted a 1989 decal transfer of the imperial two headed eagle on his shoulder pad, these were the first Warhammer 40,000 infantry transfers. Next up we have RT01 - Brother Craven armed with a bolter and apparently a knife which was quickly painted up as a power sword and again I added the iridescent paint. 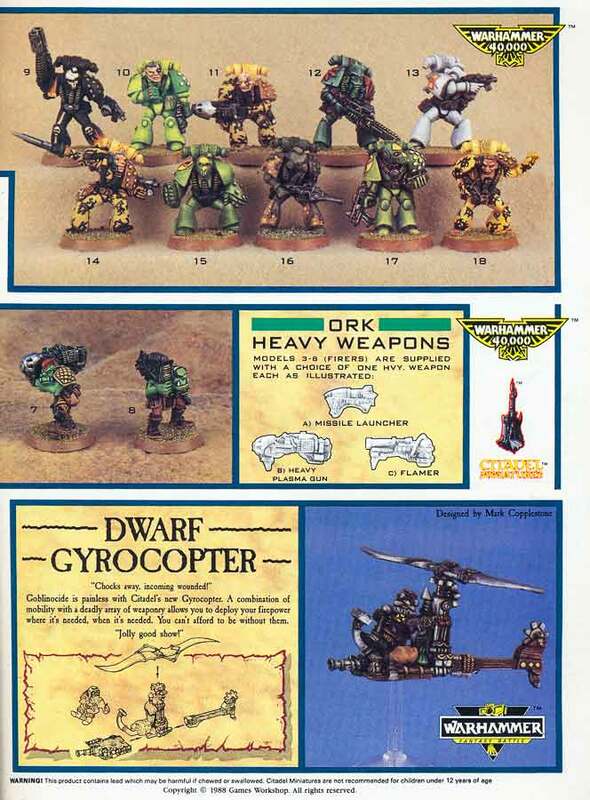 First appearing in the 1988 White Dwarf 100 advert part 1, White Dwarf 100 advert part 2, sculpting for this range accredited to Mark Copplestone & Aly Morrison. 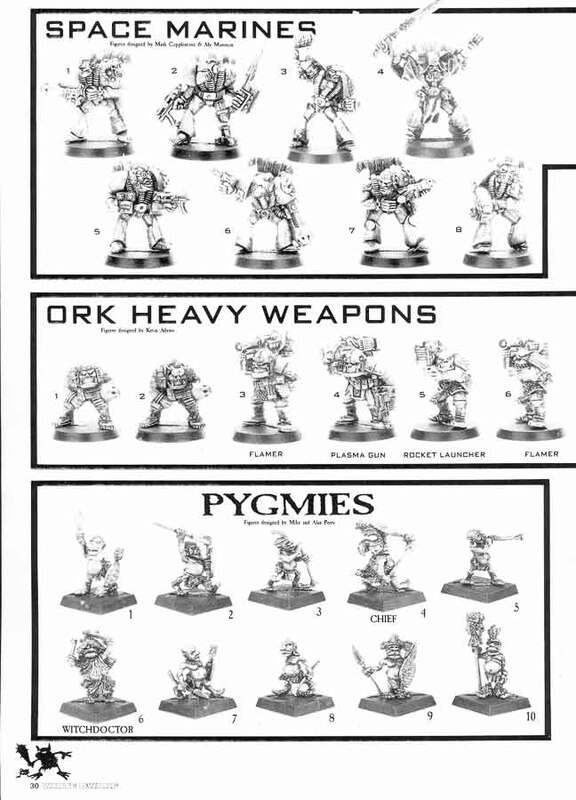 I aim to give all my marines original metal backpacks or jump packs as I find them crude, archaic and a delight to paint. The assault transfer is from a 2nd edition Ultramarine biker, it took quite a bit of setting with Microsol to blend it to the curve. 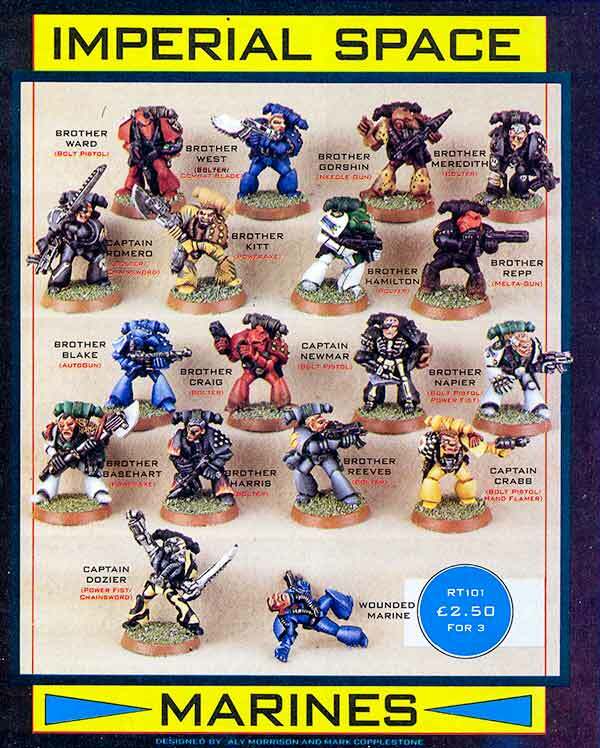 Lastly we another 1988 White Dwarf 100 advert part 1 marine, RT01 - Brother Potter who I have already talked about in the past here, armed with a bolter, equipped with bionics and a tape machine? ?, this Potter was sporting round specs years before his later juvenile imposter. I painted this one some time ago so the crimson is a bit brighter, a few touch ups and he was good to go. Although I am going to swap out his plastic backpack. I am not entirely happy with the photos UK winter light and all that and will be going back to these soon. Thanks for stopping by, many more drafts to compete and many more half painted miniatures to finish so stay tuned. Brilliant stuff! Some great history here, thanks for bringing it all back! Fantastic work mate - always great to see some old RT marines painted up so well! Those are absolutely spectacular! Beautifully done, man!